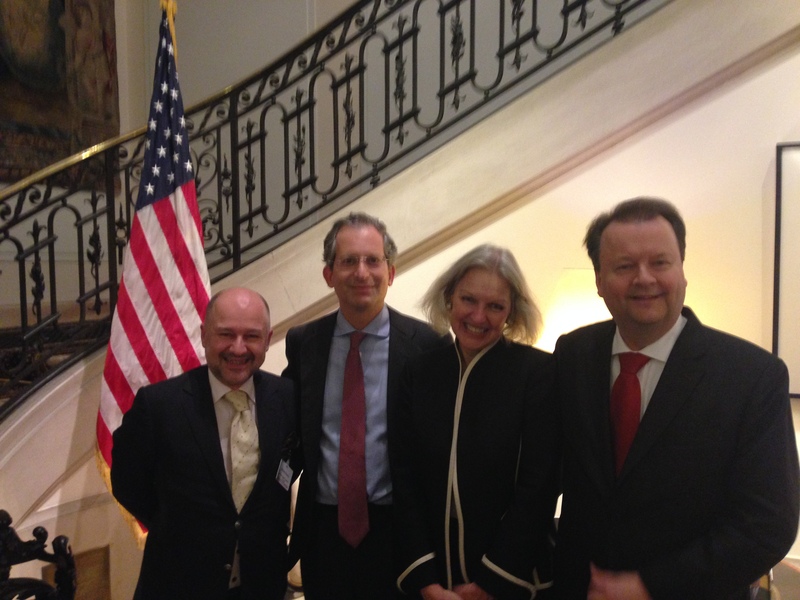 On the 5th of May, I was invited to participate in a panel and dinner discussion by Anthony Luzzatto Gardner, US Ambassador to the EU in Brussels — all organised in cooperation with The European Trade Association for Early Stage Market Players (EBAN). The programme focused on a US-Europe Dialogue on Making Ventures Grow. Ambassador Gardner hosted 50 high-level policymakers, academicians, business Angels, VCs, accelerators, and representatives from stock exchanges and non-profit organisations from the both the US and the EU. ”On May 5, I had the pleasure of hosting a U.S.-Europe Dialogue on Making Ventures Grow together with Candace Johnson, the President of EBAN, the European Business Angel Network. The event brought together public policy and private sector experts to discuss ways to expand and accelerate financing of high-growth ventures as a mechanism to spur entrepreneurship, economic growth, and job creation in Europe. Bruegel Senior Fellow Karen Wilson opened the dialogue, followed by two interactive discussion sessions moderated by Peter Speigel of The Financial Times and Stephen Fidler of The Wall Street Journal. The first discussion session on “Broadening Europe’s Capital Markets & Stimulating Alternative Financing” focused on what can be done at the EU level and by U.S. and European investors to broaden the financial instruments available to innovative, high-growth firms, facilitate the development of Europe’s debt and equity capital markets, and stimulate other forms of alternative financing. The second discussion session on “Facilitating the Growth of Ventures in Europe” centered on what can be done to support the scaling up of startups and innovative young firms, the further development of venture capital and angel investment, the role of U.S. and European corporations in facilitating the creation and scaling of startups, and what can be done to boost the flow of institutional investment into venture capital. We discussed themes such as how to address regulatory and legal barriers to responsible risk-taking, the development of exit markets and entrepreneurial ecosystems in Europe, and the incentives needed to increase private investment, including by institutional investors. We also focused on the need to increase awareness and interest in entrepreneurship across Europe – particularly with young people – through education and mentoring. European Commission Vice President for Jobs, Growth, Investment and Competitiveness Jyrki Katainen made keynote remarks and received a summary of the discussion conclusions from Karen Wilson. The event included 50 participants from leading American and European venture capital and private equity firms, angel investors and accelerators, stock exchanges, corporate venture funds from leading digital firms, and related foundations and associations, along with officials from the European Commission’s DG Internal Market, Industry, Entrepreneurship and SMEs (DG GROW), DG Financial Stability, Financial Services and Capital Markets Union (DG FISMA), and DG Research and Innovation (DG RTD), the European Investment Fund, and the European Parliament.